I Want to Teach Forever: Use Number Sense To "Make the Most of It"
Last week I shared a simple graphic organizer for practicing operations with fractions. That activity was actually based on a much simpler one designed for first and second grade students. 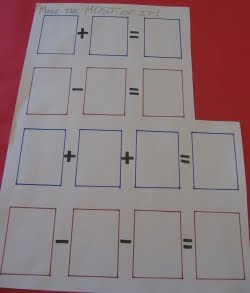 I named it Make the Most of It, because students are given about half a deck of cards and given the pictured graphic organizer to fill with number sentences. 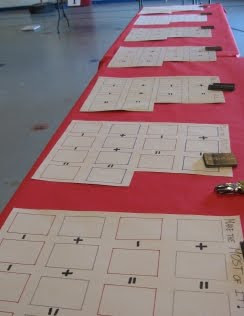 The graphic organizer was made with half of a posterboard, permanent markers, and a small cardboard rectangle to trace for each box (it is slightly larger than the dimensions of a playing card). While this isn't by any means revolutionary, it's a way to inject some fun into practicing basic operations with integers. If you make a number of them, as I did for a recent event at a local elementary school, you can turn it into a competition. The activity changes each time because of the cards a student might get and what they decide to do with them. You can use a standard deck of cards, but you must decide what to do about face cards. Otherwise, look for a special deck that contains only numbers. Of course, you don't need the graphic organizer to do this activity, as I wrote about in November, but I think it helps. Doesn't this look like fun?